The Patagonia Skeena River Fly-Fishing Waders for Men are Patagonia sized fly-fishing waders for men that are feature-rich and affordable and are designed with an H2No Performance Standard polyester microfiber shell that contains a proprietary waterproof and breathable barrier as well as puncture resistant and durable NanoSphere DWR finish. 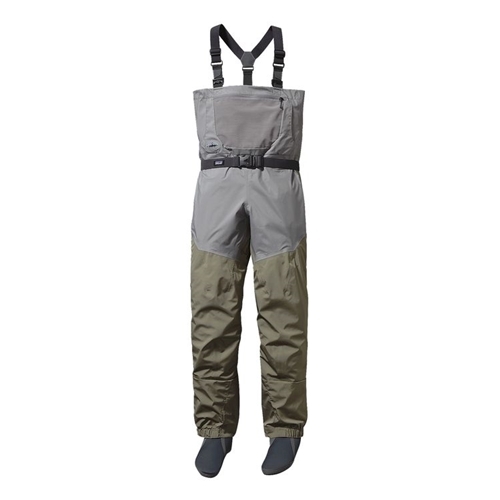 These king fly-fishing waders for men also comes with waist-mounted EZ-Lock suspenders to provide anglers with easy conversion from chest to waist high waders and also offers a TPU slide-and-lock design on the front and back for even more safety when deep water wading with these king fly-fishing waders for men. The Patagonia Skeena River Fly-Fishing Waders for Men is constructed with a full elastic back for all day comfort and also offers men with an upper reach-through kangaroo pocket as well as a horizontal-zip chest pocket for easy access to tippets, nippers, floatant and other fly-fishing gear that is really another awesome feature of this very innovative and economical king sized fly-fishing waders for men by Patagonia. The Patagonia Skeena River Fly-Fishing Waders for Men also features an interior welded TPU-waterproof zippered pocket to ensure that your valuables stay safe from the elements as well as a Hypalon utility keeper to provide anglers with easy access to fly-fishing tools. These king fly-fishing waders for men also features anatomically curved knees and anatomically designed left and right booties with abrasion resistant soles. These king fly-fishing waders for men also includes a field repair kit that is another awesome feature of these very economical and innovative Skeena River Fly-Fishing Waders for men. These Patagonia Men's Skeena River Fly-Fishing Waders are amazing in every way - the way they look, feel, function and deliver, I couldn't ask for a better pair of fly-fishing waders because these Patagonia Men's Skeena River Waders are exactly what I was looking for in a quality pair of men's fly-fishing waders.